Dark woods are very popular in home design right now. Darker hardwood flooring such as walnut, mahogany or tigerwood are popular as are espresso and sable staining on lighter hardwoods. Some people love the look of darker wood but are concerned about how it will fit in their home. Will dark hardwood floor make the room too dark? Feel too small? What type of flooring should I install with dark wood cabinets to keep my kitchen looking spacious? I like the grain and price of oak but I really want a dark wood, what are my options? These are all valid questions and we have the answers! Does a dark hardwood floor equal a dark room? In any size room a dark wood floor is going to make an impact. You'll want to carefully consider the furniture, wall colors and curtains to help balance out the darker shade of flooring. If you are installing a dark hardwood floor in a small room or a room without windows, it will likely make the room feel smaller. However, sometimes that smaller feeling creates a cozy, intimate setting. 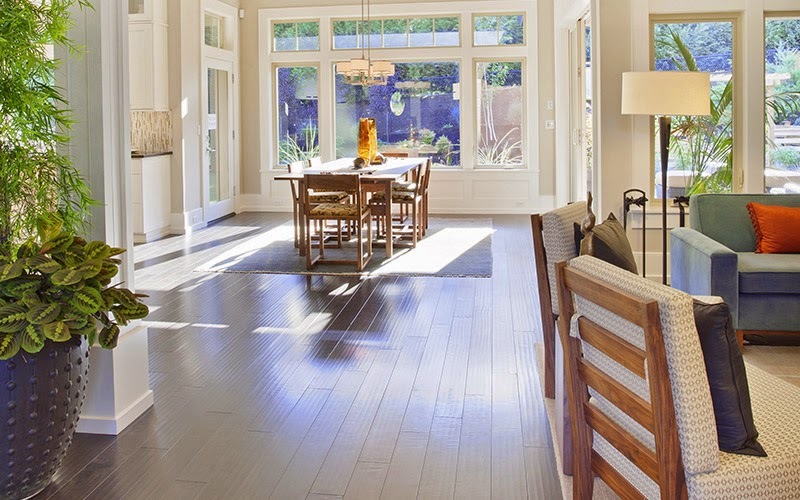 In a larger room, a dark hardwood floor can make the space feel more manageable. 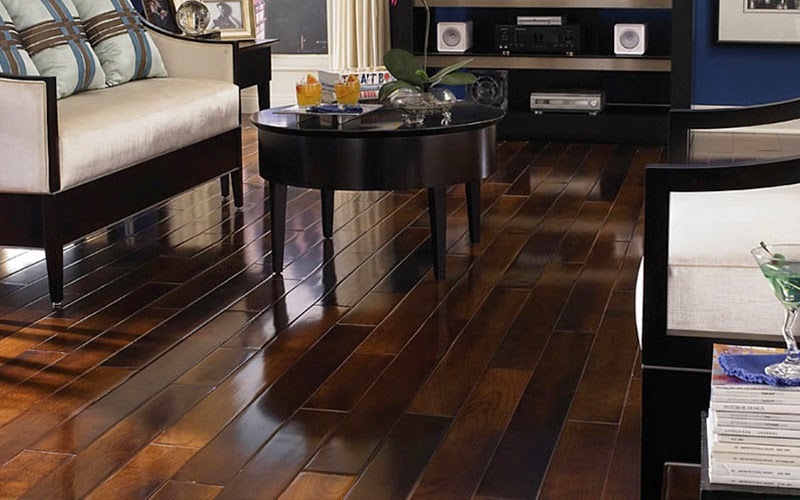 Dark hardwoods work well in any room. In a great room they create comfortable feel that lends itself well to entertaining. A white kitchen with a dark hardwood floor is a classic combination. Dark hardwoods are a beautiful addition to a bedroom, where the darker influences are more soothing and welcome. In short - a dark hardwood floor does not equal a dark room. What floor works best with the dark wood cabinets in my kitchen? Dark wood kitchen cabinets or bar cabinets are a classy trend. They look especially nice with stainless steel appliances and chrome fixtures. However, homeowners can be stumped picking the best type of floor to balance out the dark wood at eye level. We recommend looking at tile or lighter wood floor options. It's perfectly acceptable to mix types of wood in cabinets and flooring. Or you could consider the same wood species but with different stains to create that dark/light balance. Tile is an even lighter option to consider. Made from natural materials, just like the wood in your dark cabinets, tile brings a beautiful luster to the room. Slate, ceramic or marble - any tile option will work well with your dark wood cabinets. And don't feel restricted to white tile! Shades of gray, cream or tans might work even better in your kitchen. Tile isn't just for floors! Glass tile back splashes are a great way to balance out darker kitchen cabinets. Tile mosaics can add some bright colors for a design punch or muted, lighter colors to bring some light into the room. Glass tile back splashes are easy to clean too - a great addition to any kitchen. I like the grain pattern in oak or maple but I really want a dark wood. What are my options? Don't feel that dark wood only means exotic wood species or walnut. Any type of wood can be stained nearly any shade. From coffee brown to reddish brown, from deep black to espresso - you can make any wood species just the right shade for your interior design. Laminate wood floor is another option that might give you more choices in shade and grain patterns. 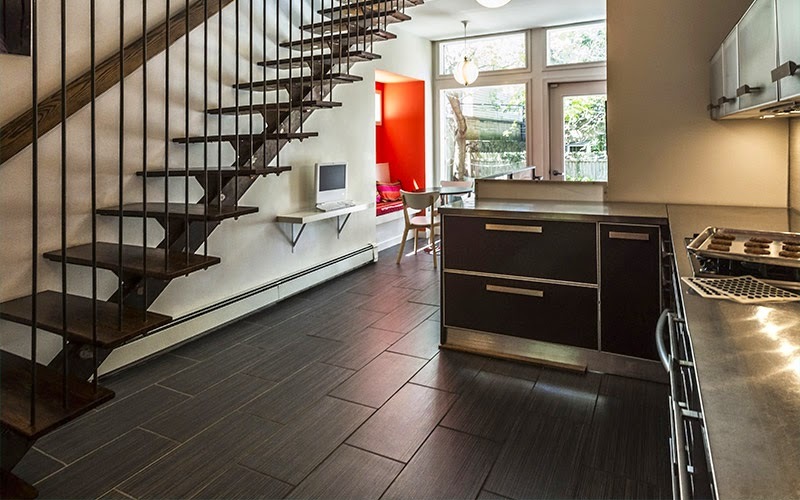 Dark hardwoods are a trend that's here to stay. Stop by Kermans flooring store in Indianapolis to view our wide selection of wood flooring and start looking for the shade that's just right for your home. We'll give you samples to take home and view in your room so you can get a feel for what really fits. We also carry a wide assortment of area rugs to create a conversation area or place something soft underfoot near beds and other furniture. Our free design staff can help make any trend work for you!